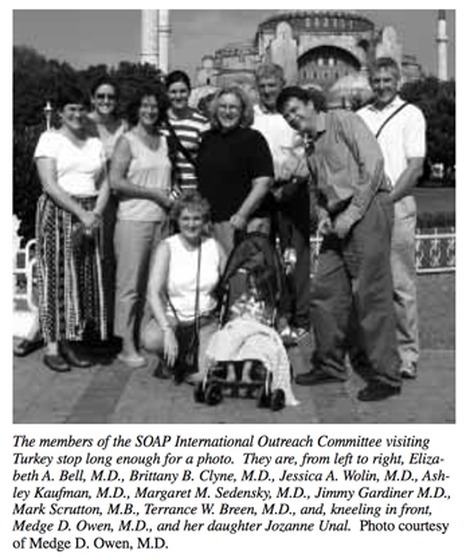 The 2004 Annual Meeting of the Society for Obstetric Anesthesia and Perinatology (SOAP) on May 12-16 in Ft. Myers, Florida, spawned a new International Outreach Committee. The purpose of the committee is to promote safe obstetric anesthesia practices worldwide by facilitating educational exchange programs. There is a worldwide need to improve childbirth conditions and safety. In many countries, pregnancy and childbirth are the leading causes of death and disability among women. Women worldwide deserve the right to safe and comfortable childbirth, and for this reason, the International Outreach Committee is already at work. In September 2004, eight obstetric anesthesiologists from four countries landed in Istanbul, Turkey, to inaugurate the first teaching trip. Turkey is a country with 70 million inhabitants (roughly 25 percent of the U.S. population) and 1 million annual births. Regional anesthesia and analgesia for obstetrics is relatively new in Turkey and not widely practiced. Our goal was to demonstrate regional anesthesia techniques for obstetric patients and to serve as a “safety net” for physicians learning management skills and protocols. After a two-day group orientation about Turkish culture and the medical system, anesthesiologists dispersed to work individually in 10 academic hospitals throughout Turkey. The host hospitals varied widely in obstetric practice, case load, workforce and research efforts. The visiting doctors presented formal lectures and bedside teaching on numerous aspects of obstetric anesthesiology. What followed was a wonderful exchange of medicine and culture for all involved. 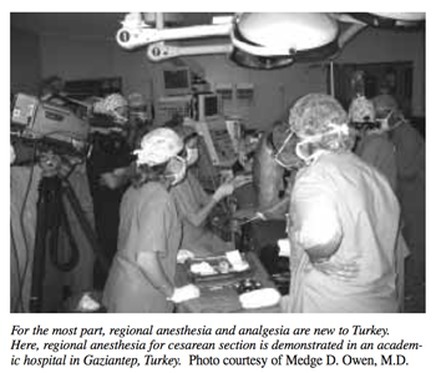 For the most part, regional anesthesia and analgesia are new to Turkey. Here, regional anesthesia for cesarean section is demonstrated in an academic hospital in Gaziantep, Turkey. Our visit sparked a barrage of media attention, including a front-page article in a major national Turkish newspaper and three television programs on issues of cesarean section and regional anesthesiology. A final program aired live on prime-time national Turkish television the week following our visit, showing a patient undergoing cesarean section with regional anesthesia. Obviously the topics of cesarean section and regional anesthesia are of interest to the Turkish public at large, not just to isolated medical professionals. One reason for this widespread interest is that in Turkey, the cesarean section rate is 75 percent to 90 percent in many hospitals, and general anesthesia is almost universally utilized! The members of the SOAP International Outreach Committee visiting Turkey stop long enough for a photo. They are, from left to right, Elizabeth A. Bell, M.D., Brittany B. Clyne, M.D., Jessica A. Wolin, M.D., Ashley Kaufman, M.D., Margaret M. Sedensky, M.D., Jimmy Gardiner M.D., Mark Scrutton, M.B., Terrance W. Breen, M.D., and, kneeling in front, Medge D. Owen, M.D., and her daughter Jozanne Unal. Another purpose of the trip was to determine the effectiveness of a group-oriented, short-term (two-week) teaching effort in promoting and sustaining advancements in obstetric anesthesia care. To evaluate this, a detailed questionnaire was sent to participating hospitals two months after the visit. All host hospitals responded to the survey and evaluated their experience with the guest anesthesiologist as either excellent (8 out of the 10) or good (2 out of the 10). Seven out of the 10 hospitals made changes in their clinical practice as a result of the program, 6 out of the 10 hospitals reported help with clinical research and manuscript writing, and all of the hospitals have maintained contact with their guests. These results are encouraging, and we will use this experience as a template to guide future outreach trips. One might wonder how an outreach project originates. First, an invitation is submitted by an anesthesiologist from a prospective country. A site visit is then arranged, and one to three committee members travel to the country to conduct an initial needs assessment. The small convoy travels with the host physician to observe the conditions and medical practices that exist within several hospitals. Then a project is designed with the host physician to fit the specific needs of the country. The host physician networks with other colleagues, and the hospital sites are selected. We focus on countries with established anesthesiology training programs. This approach is cost-efficient and promotes countrywide change because resident doctors are integrated into a national employment pool upon graduation. Physicians in training also learn quickly and are eager to perform new techniques. Our aim is to improve countrywide standards, not just conditions within isolated hospitals. The countries selected also must have an adequate health care infrastructure of supplies. We do not wish to provide equipment and medications but rather education to better use the supplies already possessed. This approach may limit projects in some of the poorest countries with the highest maternal mortalities, but unless a country has an established health care infrastructure, it is unlikely that improvements can be sustained. An important element for program success is to identify physicians who have the ability to be agents of change in their countries. For example I met a Croatian anesthesiologist named Dragica Kopic, M.D., while attending a meeting last year. She was bright, energetic and very interested in learning obstetric anesthesia but had little experience. I visited her hospital and made a number of observations. Over the next few months, we conducted a survey of obstetric anesthesiology practices in Croatia and found a limited use of regional anesthesia techniques, similar to Turkey. I invited her to attend the 2004 SOAP Annual Meeting where she presented a poster of her findings. She also spent several weeks observing obstetric patient care at Wake Forest University and Duke University. Since that time, her accomplishments have been truly remarkable. Within a year, she introduced her hospital to the use of regional anesthesia techniques for labor and cesarean section. Prior to this, most patients in her hospital had either no labor pain relief or general anesthesia for cesarean section! In addition she established two new birthing “apartments” so family members can attend the birth (previously not allowed), organized a five-member obstetric anesthesiology team that she directs and appeared on a local television program to discuss the merits of epidural analgesia for childbirth. Other hospitals in her region have heard about her and are asking for help. To address this need, we are organizing an internationally based team of obstetric anesthesiologists to go to Croatia in September 2005. In addition to the programs in Turkey and Croatia, site visits are complete, and upcoming trips are being planned for 2006 in Ghana, Africa (where the ASA Overseas Teaching Program has been providing anesthesia training) and the Republic of Georgia (formerly part of the Union of Soviet Socialist Republics). A nonprofit organization has been established to coordinate all phases of the outreach. The name of the nonprofit organization, Kybele, Inc., is derived from an ancient goddess of childbirth and fertility. For information about how you can make a tax-deductible financial contribution to this worthwhile endeavor, please contact mowen@wfubmc.edu. Medge D. Owen, M.D., is Associate Professor of Obstetric Anesthesia, Wake Forest University, Winston-Salem, North Carolina.